Neelima Thota is an experienced Engineering and Management professional with over two decades of experience in the development sector with a special focus on water & sanitation and transportation, spanning over USA and India. In the past decade, she has influenced and managed decisions & investments towards equitable, innovative and sustainable development with a focus on water and sanitation. 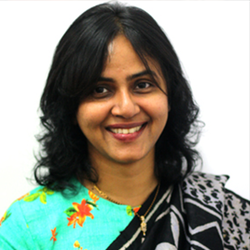 Currently, Neelima is Sr Advisor at Dasra, spearheading the WSH ecosystem.